source of plants to plant up new herb gardens. - Place to take apprentices to learn about herbs. Overgrown once pristine allotment near houses. Last available allotment on the site. Very relaxed allotment site with at least half the plots not cultivated but still held precious to folk. Nice allotment field secretary. Remains of fruit production with 3 pear trees (growth from the root stock consistent with 3 years of neglect). close to houses but otherwise at the bottom of the site and quite secluded. Faces south west. NO water on site. Soil seems clay loam. No obvious path to get to the plot and parking not easy, though there is parking on the allotment site. There is a shed and lots of soft fruit. 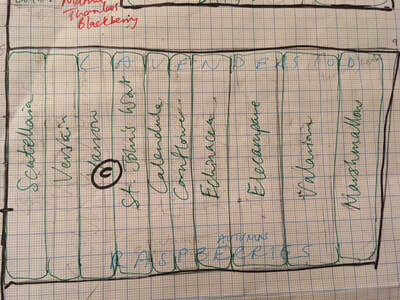 Useful: Gooseberries, Currents, Blackberries (thornless), 3 pears, 1 apple, Rhubarb, mint, some bulbs? TO KEEP: The useful plants, Im gonna value the weeds too. REMOVE: The pests, I don't like raspberries much so some will go. Not sure about the lavenders. Remove the rootstock growth. A thistle that I didnt want to spread and some rose bay willow herb. Ambivalent: a plot nearby grows brassicas without netting. REMOVE: maybe put wire netting up on the edges for any vegetables? Useful: shed small but works with two water butts, greenhouse frame and glass. TO KEEP: shed of course. Greenhouse frame to ponder over how best to use. metal poles to mark out the boundaries 1m by 1m. Ambivalent: do I need a rotivator? Useful: herbaBlitz days. open gardens (maybe), herbal apprentices, my hideaway. Part of the Observations include taming the site. When observing I need to start by being on the land a bit. So as part of the observations I get stuck in with exploring what plants are there and over a few weeks in late Autumn I managed to prune the rootstock growth on the trees, have a bonfire to deal with thistle seeds, sharp items such as brambles and deadwood. 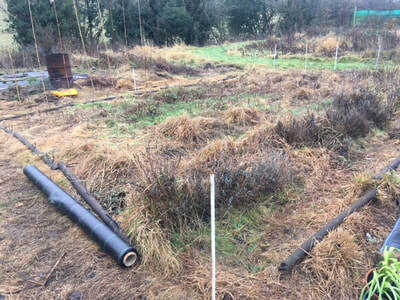 I knew that it would take months to weed the area so I have been doing what I can and covering the soil with what I have to attempt it further when I have a design. 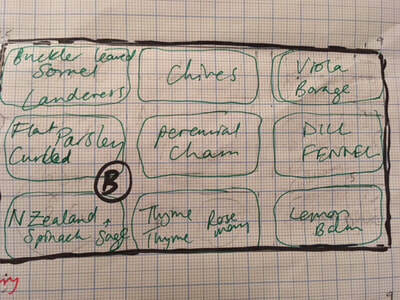 Where is nice to sit, which areas suited to vegetables, which to herbs and how much fruit to keep. Shed works and I have added another waterbutt and with a padlock can store my tools there. First step is to know what is there, so a Basemap was drawn. I chose a corner and then marked out the plot in 1m intervals from that point to give reference points for measuring. Design the parts of the plot. (certain designated areas made sense. Issues with the boundaries as not clear what the edges of the plot was. I live in fear that work I do will be claimed by absentee owner. The boundaries of the growing beds from the previous owner makes sense to keep. storage space at partner's house. Accessibility as having to walk through other plots so no car parking nearby. Getting all my plants from Old Hall over. It cost £20 for the year. I have money if needed but am looking to not have to spend much. Scavenging for weed matting and wood. The Plot has a shed with two water buts. Inside I found a rotivator. The soil seems like it has been loved in the past and there are several mature fruit bushes. There was also an aluminium frame of a greenhouse and some panes of glass. Too old but still useable to at least create a microclimate. Going away in February so need to transfer plants in January or hope they remain safe at Old Hall. 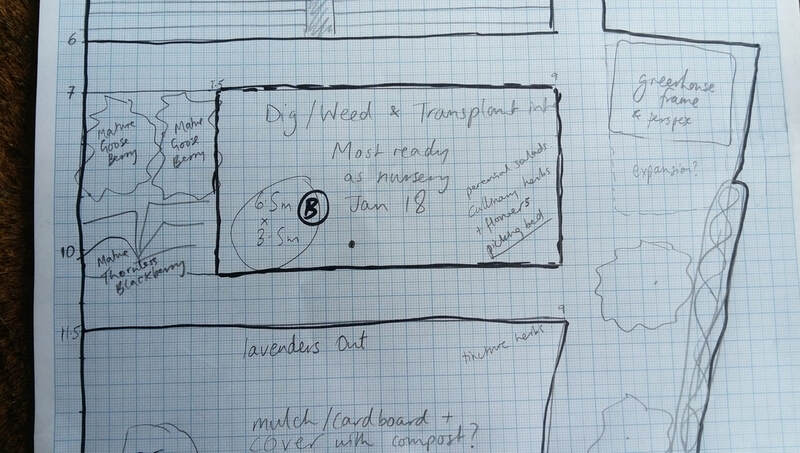 ​Makes sense to design first and move plants second. It is already proving very useful as a storage area as I have moved lots there already. The plot has given me a project. I am excited to take on a piece of land. My design on LANDHOLDING showed me how important it is to me and with a new house and very little garden to play with it seemed perfect solution. The Other allotment in the village had no space anyway. 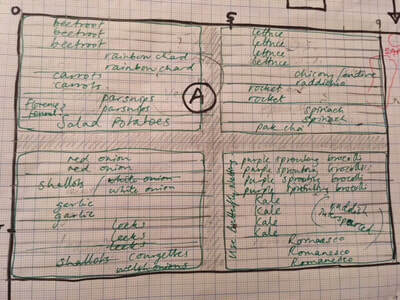 I have no choice but only one allotment to choose from and I have needed the storage space. So The next question is how best to use it and how best to focus my energy. It didn't seem worth doing an analysis of sectors as on mid winter it was all sunny fir as much as it is sunny. then Workplans: January and then mid March onwards. I have the bare bones of the base map. 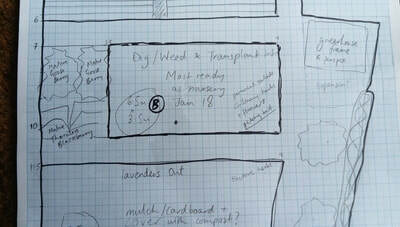 Knowledge from previous projects was the desire to plan this first then that informs how best to proceed and not dig up and replant things over and over again. Do it once is my new moto. 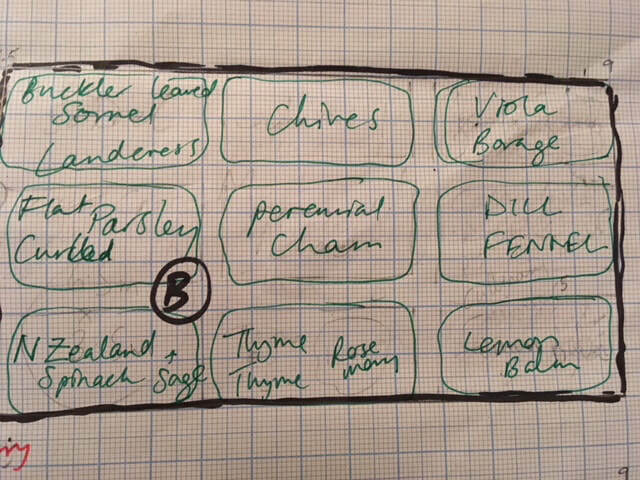 I identified 4 main areas to cultivate A,B,C,D and these are in rectangles. Past experience has taught me to keep it simple and grow crops in lines so others can help out without trampling on everything. I am trying to encourage my partner to help out. 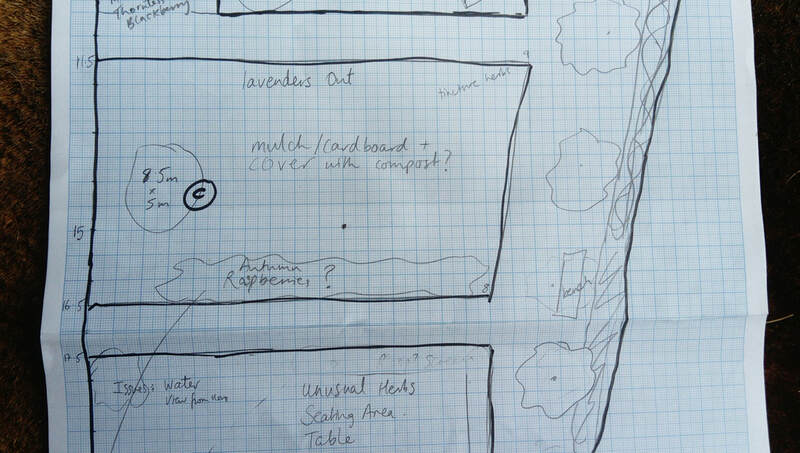 I want 1m paths (grass) to just make it easier to get about with a wheelbarrow and helps the drawing and gives a sense of space. 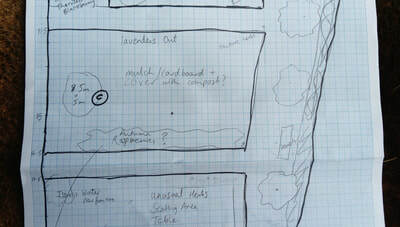 Using the client wishes I aim to identify which beds are for what purpose and therefore which plants go where. -Storage of outdoor items (pots and tools etc). Shed and D? Makeshift Greenhouse: Seedlings, Tomatoes, Lemon verbena, Basil, Tender Herbs. B - 3m by 6.5m NURSEY BED - Near the greenhouse and the smallest bed so for seedlings, perennial salads and culinary herbs. C - 5m by 9m TINCTURE HERB BED - this can be filled with plants from Old Hall such as Marshmallow, Valerian, Elecampane, St. Johns Wort and Vervain. Think about shade needs and height.... To get shade for the Marshmallow and Valerian I thought about growing east west and this also means I get 9m of different crops if I crow in a line. D - 8m by 8m CHAGRACULTURE - MAGIC GARDEN​ - I have had an idea for a magic garden which can not only be the everything else space but also aims to trial out what makes a space special. It needs to be a social space, the fire, maybe a pond, shelter, feel like a sanctuary, hold the unusual herbs that I grow like Phytolacca, Euonymus, garden plants I have loved and will bring with me from Old Hall. I have left a Gooseberry row at the bottom boarder and I propose a screen of runner beans/ climbing french beans to add to the enclosed nature whilst leaving the view open to the sun. I will create this as another design in the portfolio. He puts this into the Analysis of a SADIM method can I am using it here as a checking tool to make sure I consider everything in my design). I am using these headings from Yeoman's Keyline Scale of Permaculture, But being aware that this is a small area approx 10m by 30m. Climate: 300 m2 so climate is uniform. But see below for Microclimates. Landform: Flat. minimal slop and the whole allotment site slopes but I am on the flat bit at the bottom. Hoping this means moisture in the ground. On the site it drops half a meter (approx not measured) over 30m. Roads/ Paths: How will the space work with access? I can cope with no parking space. There are area in the allotments. Having worked out the 4 rectangular beds I am optioning for 1m wide pathways to make the plans easy and to allow no hassles wheelbarrowing. I have learnt that simple is good. Structure can allow wildness to flourish. 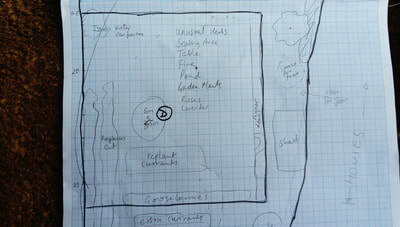 For the Magic garden I want to think hidden entrances/ nooks/ enclosure. I am aware of edge effect but this will happen naturally and in a small space I like to keep it simple. Plant Systems: I have taken over a derelict but once loved plot. Three pear trees, One apple and many mature currant and gooseberry shrubs. 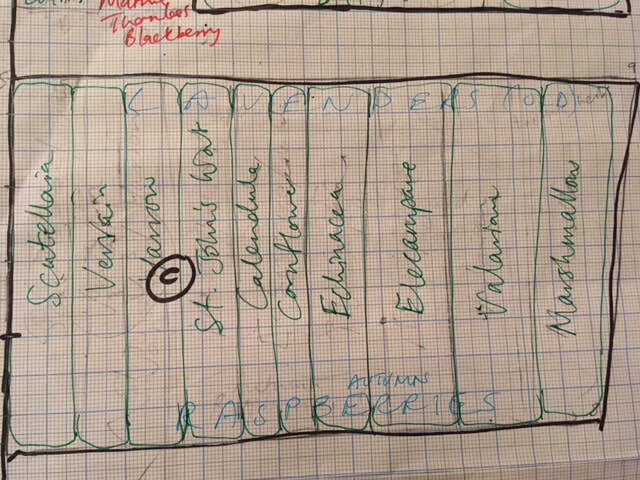 The 4 plots I identified are to be for Vegetables (four sections in rotation/ Perennial picking herbs (cullinary/ teas) a Tincture herb bed with some of the larger herbs and finally a magic garden for everything else. Im thinking about guilds of plants but will try to keep it simple here and use my knowledge to guild things up naturally. Shade loving in the shade of other plants. vegetables on the first plot you come to to remind me to pick and eat them. Bulbs I found under the pear trees. Micro climates: A sector analysis may be going too far as even in mid winter the south facing nature of the garden casts hardly any shade with the fruit trees planted on the boundary casting to shade. 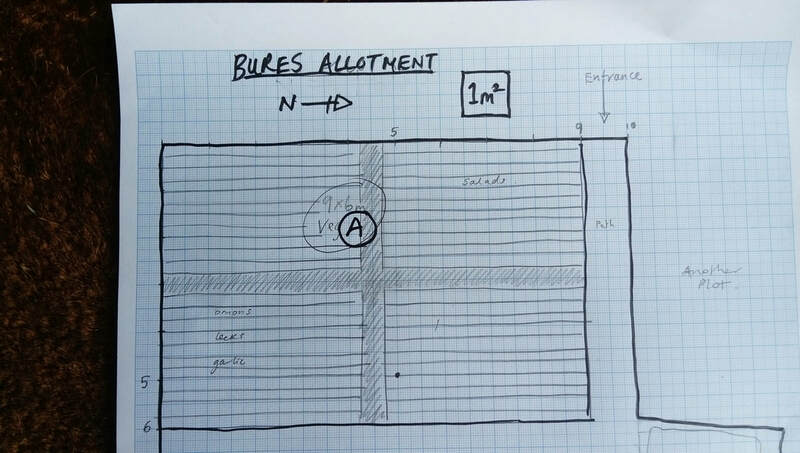 I have an overlap to the allotment basemap and have highlighted considerations such as shade/ hot/ wet/ dry etc. The abandoned greenhouse frame will provide an opportunity for hotter microclimates as will any vertical walls. I am trying to get some shelter from wind too (thought not a windy site) and introduce water storage where ever possible. Im keen to spot opportunities and niches. Buildings: I have the existing shed and a frame of the greenhouse. I want another shelter in the magic garden so think water capture, social space etc. I have two cottages on my northern boundary which which does mean I am not totally secluded. They are lovely ladies that live there. soil: jam jar. There is more clay than I have had before, but soil feels good. 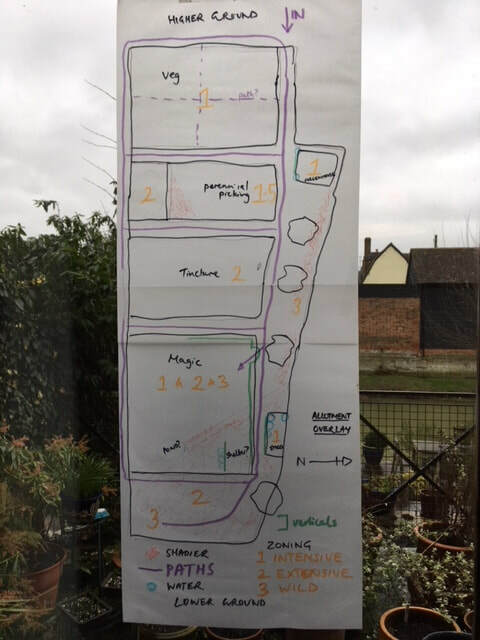 See the planting plans for the 4 growing areas. ​red is existing items, light blue - things removed, purple things moved or added and green the proposed plan. 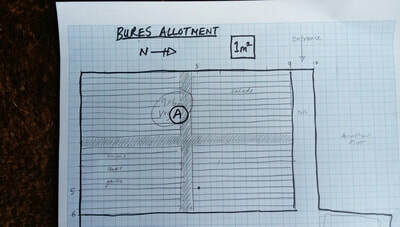 I had several sessions on the allotment before starting the design. The pear trees had massive suckers growing out from the root stock. A general tidy up. Fire burning all the bramble and thistle seed heads. I love this time just being on the site getting a feel for it. This is an important stage in the process for me. 4 levels of Intervention: biological, mineral, mechanical and finally chemical. I was lucky to get my allotment in November but I knew that I would be away in Spring. This combined with wanting another land design for my diploma and a need to have land ready to take the plants when I was moving led me to panic a bit. HOW TO CLEAR THE WAIST HIGH GRASS. Mechanical: there was a rotivator in the shed but really for waist high grass! I did get the shears out and chop the height down. I felt overwhelmed. I had lost my scythe at old hall somewhere. Chemical: It feels dirty to say it. I had been working with the council and they spray and it seemed so easy. So I did it and after checking plants on site tried it out. And It has been amazingly effective. I did leave it off the vegetable growing areas as a concession. I combined this with clearing what I could, burnt brambles, rootstock growth, thinnings and have covered the four growing areas with mipex weed matting and scavenged items to keep the weeds down and I will take it up when back from abroad. What to do in January before heading off abroad for 6 weeks? 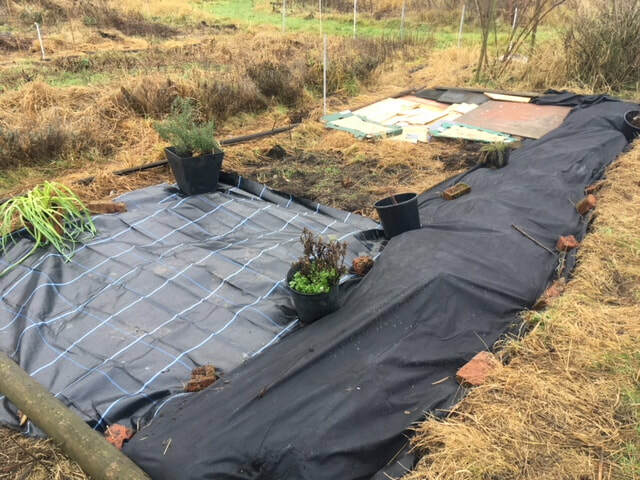 When I come back it will be Spring so Ideally I can take off the weed matting, final weed and start sowing seeds. Structural Items that need building buying or scavenge for: shelter, greenhouse fittings, I have bought a roll of mipex weed matting to ensure this got done. £50! ​Who can help me? Apprentices? My Dad maybe? A herbaBlitz? I can now prioritise jobs and the moving of plants from Old Hall. 2) Identify the plants that need attention on allotment before leaving.- old lavenders heeled in ok?/ any pruning to do of fruit? 4) label to say Ill be back later in year? tick. leaving one area to deal with when back. Primarily for plants going into the Magic garden. Inform on the land board at Old Hall which areas free to cultivate. 5) arrange to plant the plants, ideally on same day. Heel in or place in final position DEPENDS ON TIME and if he tincture bed can take it. It may be I selectively weed a small area to plant them into their final places. B- SUNDAY DAYTIME last day before Diploma Deadline for Hannah Tutor!!!!! C- Tuesday am Get plants from old hall, prep my room for sub letter. Afternoon plant them! D- Wednesday in London but afternoon possibly? E- Friday another load or filing cabinet notes? Afternoon check allotment. Looks Like Tuesday and Friday are my only real chances, SUNDAY IF DIPLOMA DONE. 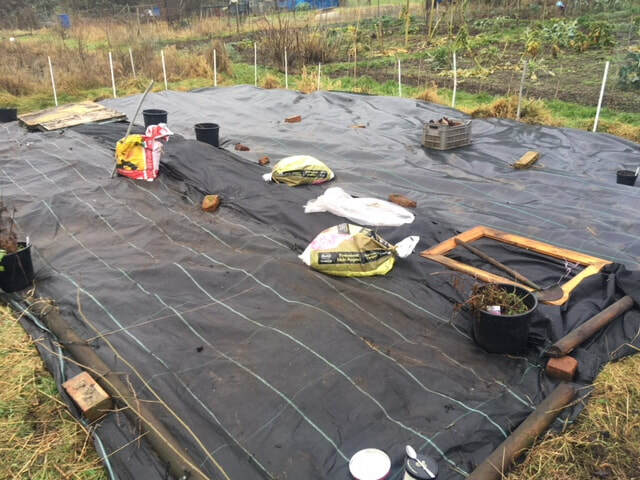 D WED 5 and prep Tincture bed and perennial bed to avoid heeling in plants if poss. E FRI last of 5. Holiday..... (The above all got done with some poor heeling in of plants into the pre dug out pond area. In Singapore Airport and looking over Hannah's final diploma feedback...... A few delays put back this.... I was meant to have got it done on Wednesday but hey....). Look at plant and have labels pre written. Uncover mipex weed matting from those areas with plants waiting and place over paths.to control grass vigour. bring over final plants from old hall. I am tweeking the diploma and nearing the end after my tutor's latest comments. I started the day at the Allotment to keep it fresh in my mind. I now have a little more land to add to the area so vegetables and flowers can be grown more abundantly and I may also allow more extensive herb growing in too. I have had lots of fruit and seemed to carry back a hand full of something every time I returned from the allotment. This Autumn my goal is to prep the new area and finish the shelter in the magic garden. When the Implementation is finished then the fun starts. I hope that I will have vegetables to tend annually and the rest of the site will become extensive. I can then have fun in the greenhouse and in the magic garden. I will want to use the space socially, cook food and have it as a learning area about herbal medicine. SUMMER: Tweaking the vegetables and plants. Social times and hosting herbal apprentices. WINTER: Construction and Mainenance of structures/ Planning next year. Earth care: maintaining the allotment with respect for nature. Not needing to use chemicals again. Regular maintenance to keep it fun rather than a chore. People Care: It can be my magical retreat abut also a place that inspired others as well. A place of learning and food and medicines to help myself and others. Fair Share: Im not greedy with my landholding.....I will have time to help others too. Give produce freely in the spirit of sharing experiences and surplus. DESIGN: Design from patterns to Details, make the least change for the biggest effect, relative location, Each element, accelerated succession and evolution. 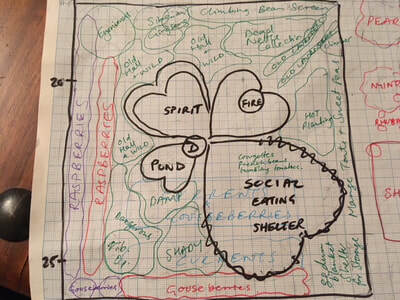 The above is an attempt to look at three versions of permaculture principles in terms of OBREDIMET. The value is partly in the exercise. 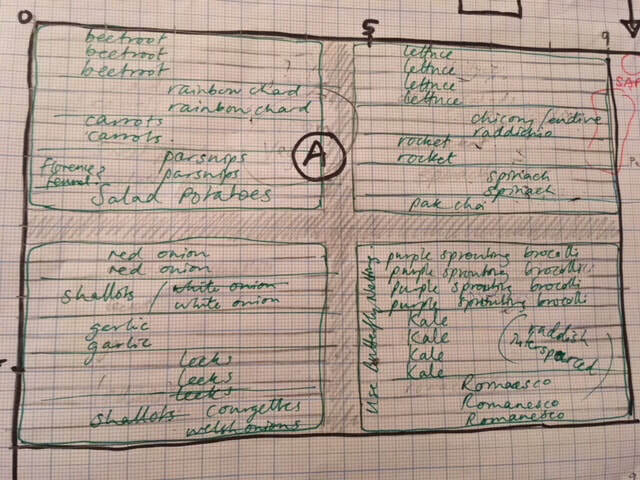 In terms of using principles for the maintenance of the allotment it does rely on good design to function well. In the maintenance stages I can be aware of which weeds can be placed back on the ground a compost mulch, how to get many elements to have multiple functions. 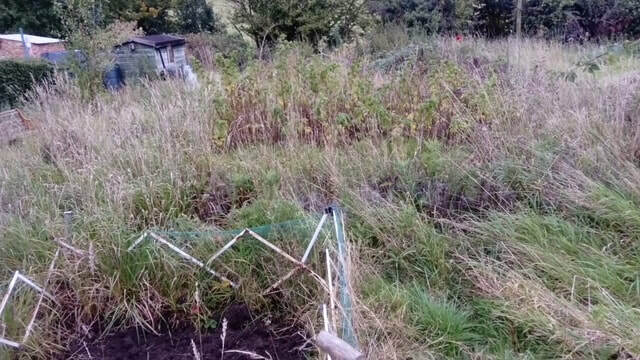 Am I using the diversity of the allotment, the people there, the wild plants I can harvest, do I need to move things, do I need to cycle back through OBREDIMET to evaluate? Constant observing and interacting, can I use the edge more. What creative uses of the space can I come up with and can I use it for apprentice training? I do notice that I now tweak with a slow observational mind and only do what I have thought about. I feels great as I can rationalise a job for another day and not worry. I have also set myself a 1 hour limit and enjoy just doing what I can in that time - I always feel so much better mentally for doing this and stop before I get too tired to reflect on what I have achieved. Felt fantastic to do a design with intent right from the get go and write it up as i went. So only half way in the implementation but very happy with how it has gone/ is going. e.g. Moving currants and gooseberries to defined places in one easy go..... fab. What I needed to do before going away. TICK DOING. Enjoying the planning to allow me to know what seeds to keep and what to give away. When snatching time to do more it focusses the mind - e.g. with just an hour, it helps most to get this bit done! I have really enjoyed the process and time spent on this piece of land. But Did I meet my aims? harvest for use, Yes The ones I use most. source of plants to plant up new herb gardens. All my favourite plants which as they grow can be divided and propagated. I also bought small pots and have planted them up to use in future garden designs as larger plants. I used the transition allotment on the other side of the village as a plant nursery as well. Harvesting the greens items (chive tops) for the monthly market on the condition that I can dig up when doing a garden for someone. ​-Some veg/ flower produce for home use. I have not set up the Vegetable section in 2018 but have planted pumpkins on it as heatwave in summer put pay to new veg plants but ready to go in 2019. Also an additional allotment next door gives space for additional vegetables and flowers. -Storage of outdoor items (pots and tools etc). Yes already invaluable in the move. -Retreat & (Chagraculture demonstration). This is my intention...... Use it and it will be. See next design. - Place to take apprentices to learn about herbs. I am taking interested people to help set up the space but will wait till 2019 and the completion of the Magic garden to entertain people. New idea is to use the shelter I am building to be the video backdrop for herbaculture video vlogging. Also To map out Ethics and principles as well as the herbaculture theory of change on the fence in the background. SO WHILST NOT FINISHED I AM WELL ON THE WAY TO MEETING MY AIMS VIA THIS DESIGN. 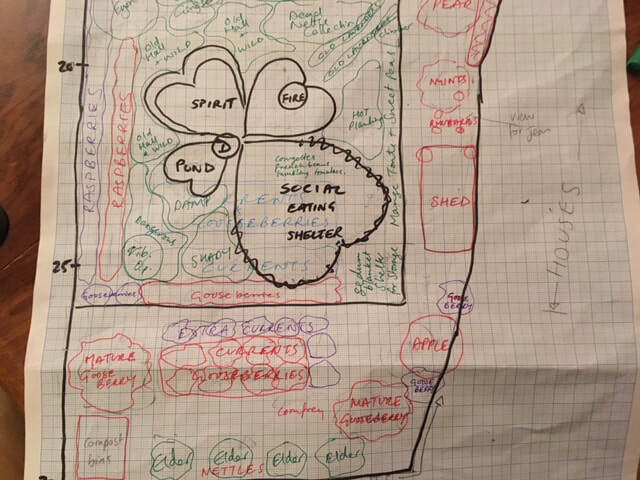 The OBREDIMET is perhaps the most used permaculture design tool. It served me well here. I like it better than the previous times I used it. but I still prefer SADIM. This is the stage I wanted to get to where I can be in a place with ideas. Then mark it out put the ideas onto paper and do it. If It was a client I would have to draw it better and put some time into the time it would take to implement so as to know how to charge a fair fee. Without a design - a permablitz would be a nightmare, with a design it is possible. I have invited apprentice herbalists to help me with the next steps. Im going to call it a HerbaLearning HerbaBlitz planned for 2019. 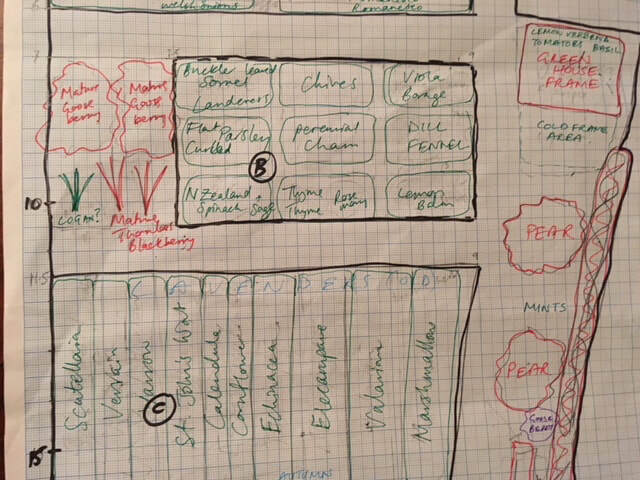 I am more confident with permaculture designing and have been intentionally using and repeating some of the basics like zoning. 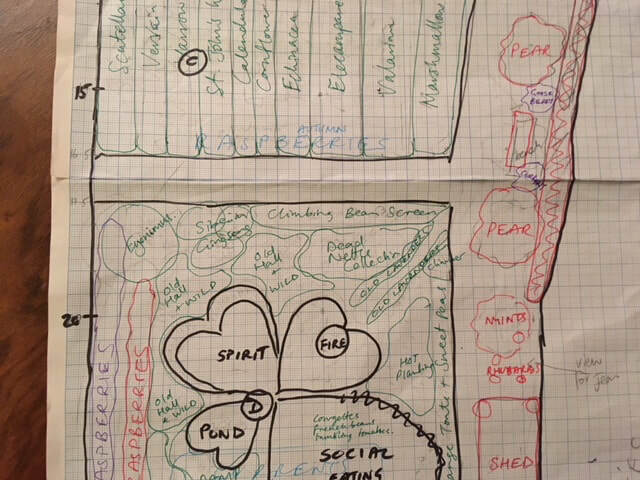 It may not be fancily written up but it is becoming more normal to think in a structured permaculture way without losing the spontaneous creative side of me.